From a seasonality standpoint, there isn’t a more reliable time of the year to have a selloff than this upcoming week. In the past I have referred to is as “The Weakest Week”. 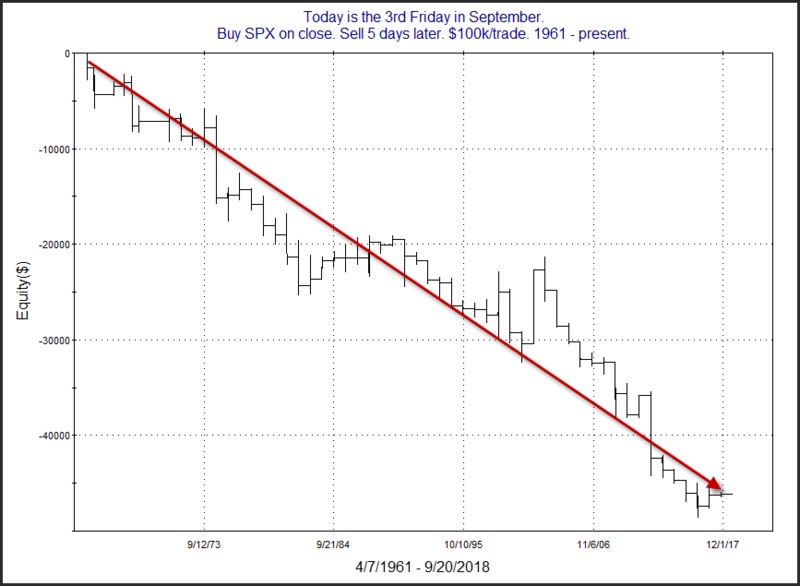 Since 1961 the week following the 3rd Friday in September has produced the most bearish results of any week. Below is a graphic to show how this upcoming week has played out over time. As you can see the bearish tendency has been pretty consistent over the last 57 years. There was a stretch in the late 80’s where there was a series of mild up years. Since 1990 it has been pretty much all downhill. Below is a table showing results of buying Sept. op-ex Friday and then selling X days later from 1990 – 2017. The consistency and net results appear quite strong. I note the only instances that didn’t post a lower close at some point during the following week was in 2001 and 2017. The 9/11 attacks certainly made for unusual circumstances in 2001, and 2017 did not see a decline, but it only rose 2 points, so it was not much of a victory for the bulls.